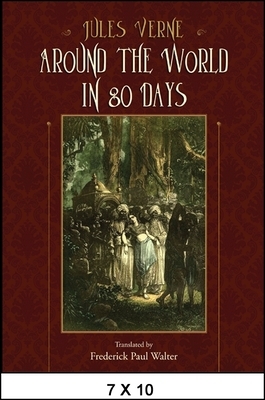 Part manhunt, part love story, part social satire, but mostly a race against the clock, Around the World in 80 Days is Jules Verne's most rollicking novel. When Phileas Fogg, a wealthy British gentleman who lives his life "with mathemetical predictability," bets the fellow members of his club 20,000 that he can circle the earth in just eighty days, he and his new valet, Passepartout, set out on a whirlwind tour of the globe that will challenge their luck, their wits, and their wallets. En route they ride an elephant smack into an exotic murder cult, steer an undersized sailboat through rampaging storms, and outrun sharp-shooting Sioux, man-eating wolves, and Scotland Yard's dimmest detective--only to see everything go hopelessly haywire until Verne springs the slyest of surprise endings. It's one of the planet's favorite thrillers, and Frederick Paul Walter's reader-friendly translation captures its roguish wit and humor, packages its Americana with exceptional accuracy (one-fourth of the tale takes place in the United States), and is complete and unabridged down to the smallest substantive detail. Jules Verne was born in 1828 into a French lawyering family in the Atlantic coastal city of Nantes. Though his father sent him off to a Paris law school, young Jules had been writing on the side since his early teens, and his pet topics were the theater, travel, and science. Predictably enough, his legal studies led nowhere, so Verne took a day job with a stock brokerage, in his off-hours penning scripts for farces and musical comedies while also publishing short stories and novelettes of scientific exploration and adventure. His big breakthrough came when he combined his theatrical knack with his scientific bent and in 1863 published an African adventure yarn, Five Weeks in a Balloon. After that and until his death in 1905, Jules Verne was one of the planet's best-loved and best-selling novelists, publishing more than sixty books. Other imaginative favorites by him include The Mysterious Island, Hector Servadac, The Begum's Millions, Master of the World, and The Meteor Hunt. Verne ranks among the five most translated authors in history, along with Mark Twain and the Bible.Frederick Paul Walter is a scriptwriter, broadcaster, librarian, and amateur paleontologist. A long-standing member of the North American Jules Verne Society, he served as its vice president from 2000 to 2008. Walter has produced many media programs, articles, reviews, and papers on aspects of Jules Verne and has translated many Verne novels, including Amazing Journeys: Five Visionary Classics and The Sphinx of the Ice Realm, both also published by SUNY Press. He lives in Albuquerque, New Mexico.